Anti-theft locking enclosure designed with steel for a sturdy floor-standing display. Rotating and tilting features to position the unit at the ideal viewing angle. Pair with a headphone jack extender (not included) for use as a POS system. 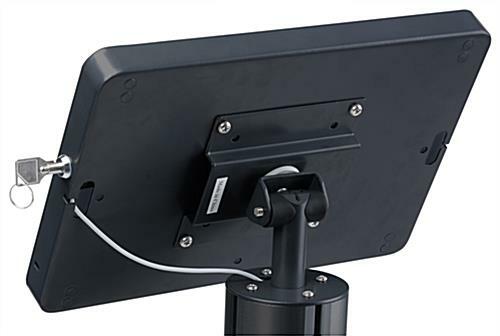 50-1/2" Black finish fixture is compatible with a variety of iPad models. Cable management system to hide charging cords in high traffic areas. Each black floor stand for iPad is compatible with a variety of iPad models. These tablet holders are quality steel enclosures to use in busy locations. 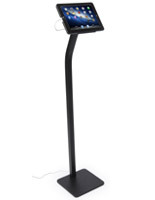 This floor stand for iPad, with cable management, stores cords inside the pole for a professional appearance. The base design is stable and secure for a high traffic area. 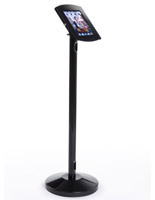 A floor stand for iPad, for Apple displays, has a sleek black finish with black enclosure. The locking case will safely secure devices in a public environment. This floor stand for iPad, that are tablet holders, are ideal point of sale solutions when paired with a headphone jack extender (not included). The kiosk design will complement a range of locations. 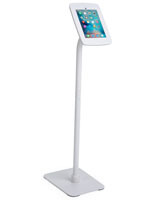 A floor stand for iPad, that rotates and tilts, is positioned at the ideal eye-level height. The locking enclosure mounts can be placed at the ideal viewing angle. 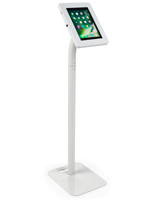 This floor stand for iPad, also known as Apple displays, can be shown at a horizontal or vertical orientation. These tablet holders are an affordable and unique design for an in-store kiosk. 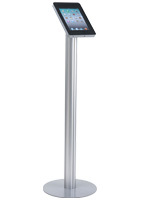 A floor stand for iPad, that includes a locking enclosure, includes space inside the pole area to hide charging cords. These Apple displays are simple to set up in a few easy steps. 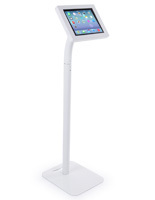 A floorstanding mount, floor stand for iPad is stable, secure and affordable purchase! This stand is solid and well-built. The base is weighted and wide enough to prevent casual tipping. The finish is good and it can accept several iPad sizes and models with the enclosed adapters. These iPad stands are super sturdy and versatile, and we're glad that you found them to be well-suited for your needs. Thanks for the great review, Gordon! Easy to assemble. Fits different size iPads (not for mini). Arrived on time. No real place to hid charging cord. Hard to access iPad home screen button. I had to use a pen/pencil tap the button. Thank you for taking the time to share your thoughts, Reuben. We appreciate the feedback and have passed your insight right along to our product team for review. We'd love to make sure that you're 100% satisfied, and do have some similar units that may be of interest to you. A customer care specialist will be reaching out to see if you'd prefer another option that suits you better. This particular model is designed specifically to limit access to the home screen button, unfortunately. We carry these options as many of our customers require that this button is hidden. However, we do have lots of options designed for easy access! Hang tight, someone will be reaching out soon. We are constantly having to replace the iPad charging cords because people pull on them from the back, and break them. This would be much better if they could somehow incorporate the cover to include covering up the plug into the iPad. I purchased two of these for an event in April of 2016 in Dallas and then took them to an event in May in Knoxville. These are the only 2 events that I need them each year. They were a good inexpensive stand for someone who only needs them a few times a year. Worked so well that I left two of them in Knoxville with my other supplies and purchased 2 more of them. Thank you for the review Sue, and thank you for your repeat business! This is a good inexpensive stand. Used 2 of them at an event. Minor issues getting it assembled but it worked better than I expected for the price I paid.